Killer -Limited Edition- FILSON Scarlet Mackinaw Wool Cruiser. A nice alternative to the indigo denim chore coat. Would work well with with dark indigo carpenter jeans or some brown duck pants. Too bad the mild So Cal winters don't provide ample opportunities for wearing such a coat (not to mention the fact that the much favored Brown's Beach Jacket gets priority). Still... can't help but think that the time and place to sport this fine garment could be found. "MIGHT AS WELL HAVE THE BEST"
Filson has been selling its Mackinaw Wool coats since the company began in 1897. The Cruiser design was named after the logging industry’s “timber cruiser”, the advance scout who crashed brush to survey the forests for the most productive timber land. 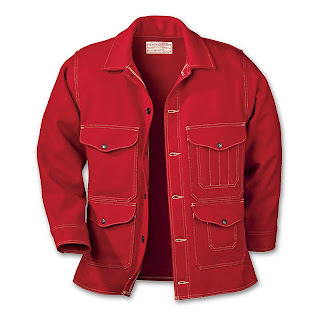 First sold in the solid red color as the “Red Mackinaw Cruising Coat” in 1922, it was later sold in 1934 as style No. 14 “Woolen Cruising Coat” in the “Scarlet” color. This style, “The Scarlet Cruiser” is one of many variations of the original Filson design. I read many posts in this website evert post is very informative. This message is great.